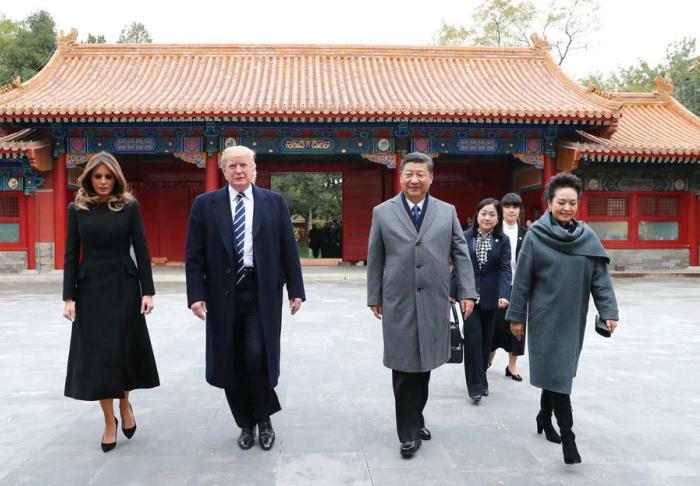 US President Donald Trump, with his wife Melania Trump, started his 3-day state visit to China yesterday. 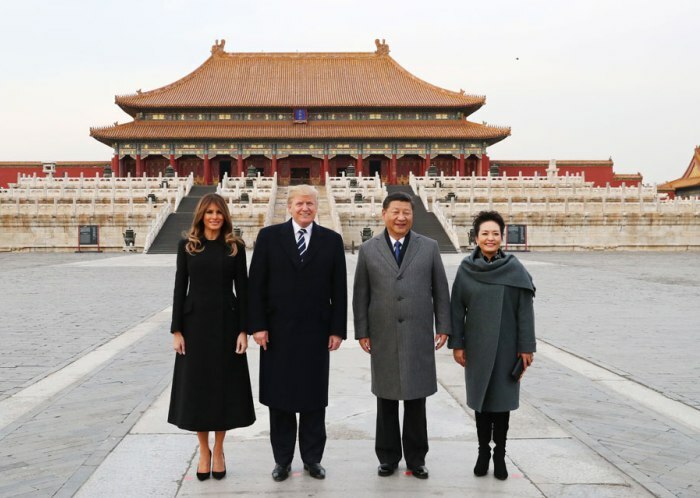 The first stop in his trip is the Palace Museum, well known as the Forbidden City, where he was warmly welcomed by Chinese President Xi Jinping and the First Lady Peng Liyuan. Situated at the very centre of Beijing, the Forbidden City has been served as the political center as well as house of emperors and their households for almost 500 years. It’s the largest and best-preserved palace complex in the world. The numerous ancient relics among ceramics, calligraphy, paintings and antiquities in the Forbidden City make it of great significance in Chinese culture. They had a tea break at the Hall of Embodied Treasures (Baoyun Lou) which is the only preserved western-style building in the Forbidden City. It was used to store treasures and relics so the name was called. During its year as part of the museum, the Hall of Embodied Treasures now serves as an exhibition hall where elaborate introductions of Forbidden City’s history are given. Crossing the Golden Stream Bridge, through the Gate of Supreme Harmony, Xi, as a highest-ranking tour guide, leaded Trump and the First Ladies to the 3 key imperial palaces which are known as the Hall of Supreme Harmony (Taihe Dian), the Hall of Central Harmony (Zhonghe Dian) and the Hall of Preserving Harmony (Baohe Dian). They once enjoyed the most dignified sociopolitical status in the empires and now serve as main attractions in the museum. 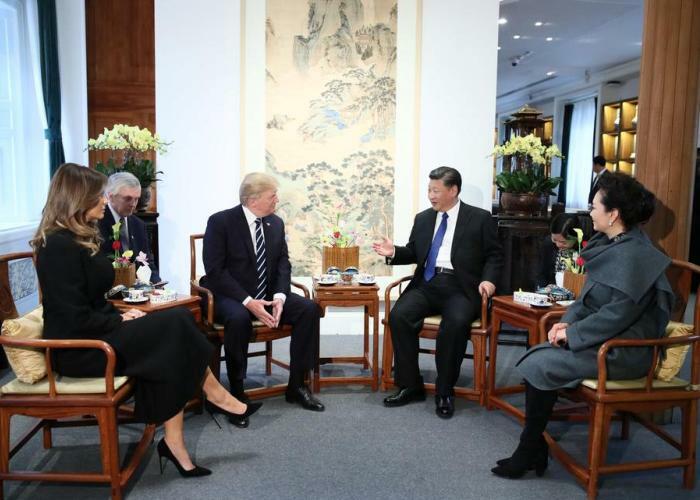 Xi told Trump that touring the museum is an indispensable way to understand Chinese history and culture. Then they paid a visit to the “Cultural Relic Hospital” – Xi San Suo where the antique restoration was done within the museum. The restoration masters treat their jobs as a lifelong career. The show of relic repairing earned the audiences’ compliments. When sun was going down, the two couples arrived at the museum's Pavilion of Cheerful Melodies. They participated in drawing on Chinese porcelain and watched some Peking Opera there. The Pavilion of Cheerful Melodies was built under the rule of Qianlong Emperor in Qing Dynasty and is the largest opera house in the museum. 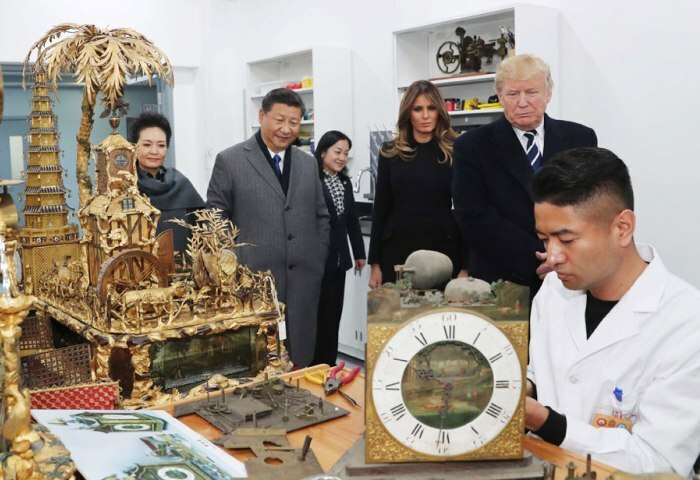 President Trump was amazed by the buildings in the Forbidden City. 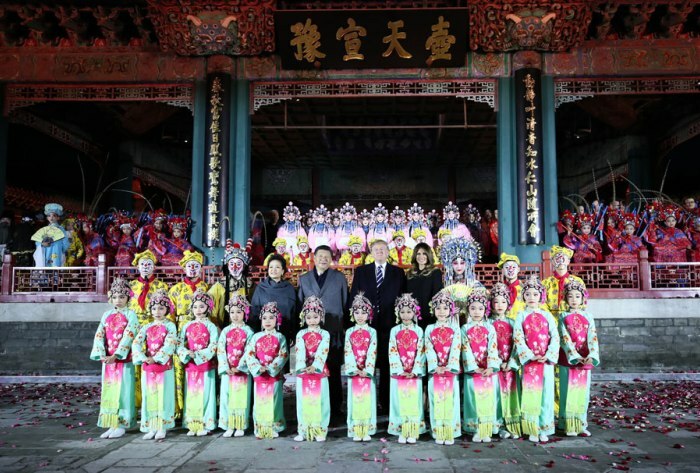 He also highly praised the time-honored Chinese culture. During this one-day tour, the two presidents exchanged their opinions about China and the US’s relationship and common interests.